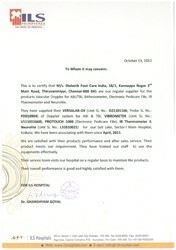 Testimonial issued by M.V. 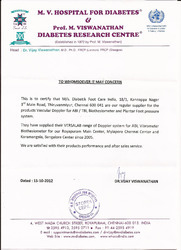 Hospital for Diabetes, Chennai. 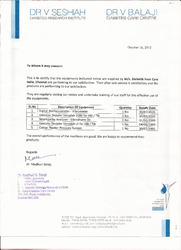 This is to certify that the equipments indicated below are supplied by M/s. 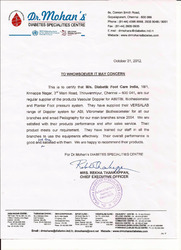 Diabetik Foot Care India, Chennai are performing to our satisfaction. 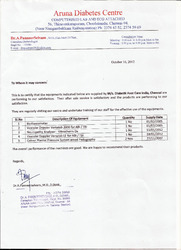 Their after sale service is satisfactory and the products are performing to our satisfaction. They are regularly visiting our center and undertake training of our staff for the effective use of the equipments. The overall performance of the machines are good. We are happy to recommend their products. 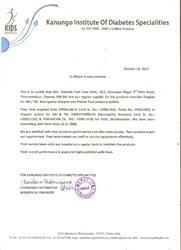 Testimonials issued by Kanungo Institute of Diabetes Specialties, Bhubaneshwar.